For Deacons, Priests and Lay Preachers, Catechists, Readers, Liturgical Ministers and anyone interested in learning about the art of preaching in an age of global indifference. Cost: $25 (other resources will be available for purchase). Cash or check at the workshop, to Fr. Warren Savage. The focus of this seminar is the Parable of the Father With Two Sons (Luke 15:11-32). Participants will be guided through four movements of the lectio divina method to interpret the deeper meaning of the parable in light of their own human condition and will be offered a pathway to experience the compassion and mercy of God. To register for the seminar, call (413) 265-2575 or email. Cost: $55 (Checks payable to Fr. Warren J. Savage). Please send check to: Ann Schwein, Religious Studies Department, College of Our Lady of the Elms College, 291 Springfield, MA 01013. Please bring a Bible for reference, study and reflection. A Seminar Workbook and other handouts will be provided by the facilitators. This entry was posted in evenings of reflection, seminars and tagged Catholic, Christian, ecumenical prayer, evangelization, Gospel of Luke, Pope Francis, Prodigal Son, scripture, spiritual formation on January 16, 2016 by Project Reach Out. Pope Francis wrote in Misericordiae Vultus that “the mercy of God is not an abstract idea, but a concrete reality with which he reveals his love as that of a father or a mother, moved to the very depths out of love for their child (MV, n.6).” God’s mercy never runs dry because it always finds people who give concrete testimony to it in everyday life. 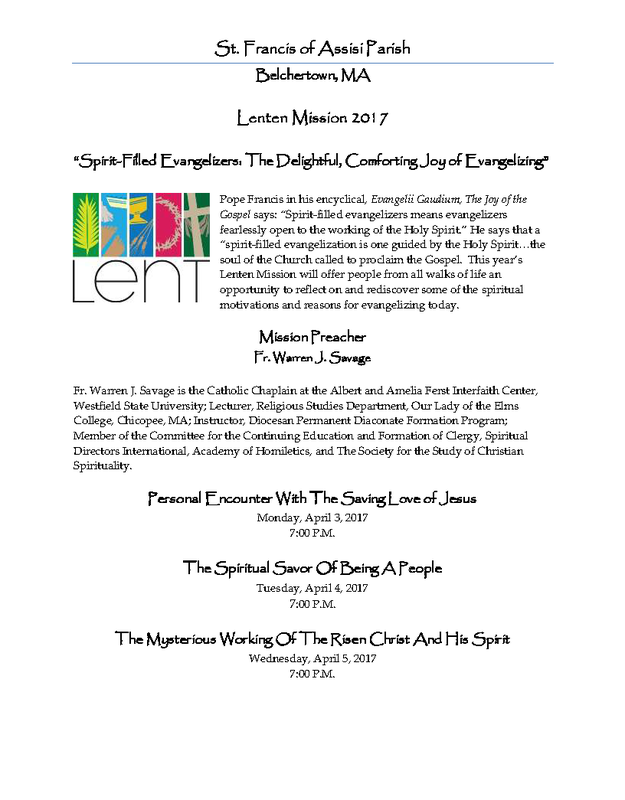 This year’s Lenten Mission will focus on the Corporal and Spiritual Works of Mercy as a way to reawaken our conscience too often grown dull by indifference. This entry was posted in missions and tagged Catholic, Christian, ecumenical prayer, evangelization, mercy, Pope Francis, preaching, spiritual formation on January 16, 2016 by Project Reach Out.